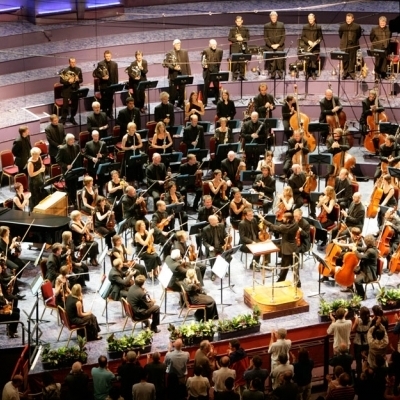 The BBC Scottish Symphony Orchestra seldom visits Edinburgh. Tonight is the first of three scheduled for this season, but unlike the RSNO and the SCO's custom of performing the same programme in Edinburgh and Glasgow (as well as at their more infrequent visits to other Scottish cities), tonight's performance was for Edinburgh ears only—at least until the recording is broadcast. That broadcast dimension poses certain difficulties in the establishment of rapport. Though they are of a similar size, and a similar standard, to the RSNO, they do not enjoy quite the same intangible 'buzz'—where Friday's RSNO played to pretty much a full house, tonight's would have been somewhere around the 80% mark at a rough estimate. Not bad—and I dare say the RSNO will encounter similar turnouts as the season progresses—but somehow regrettable all the same. Still, when that elusive audience of the ether tunes in, they'll catch up with a fine Elgar, admirably supported by the first-half Strauss and Beethoven. Saying that, the pairing of Elgar and Strauss is a smart idea, the Beethoven a somewhat random—though none the less welcome—addition. A small detail tells the story: the trumpets were playing rotary valved instruments characteristic of German orchestras, and this Egmont was correspondingly opulent in tone for this impressively driven reading. Although rich, mellifluous and avuncular, the opening Frühlung of the Four last songs that followed was somehow unfocused—not through any want of precision in terms of coordinating the ensemble, but rather in a lack of a broader sense of line. In the solo role, Michaela Kaune brings the right kind of warmth to the autumnal texts, but her voice isn't quite powerful enough to soar above the more intense passages of orchestral writing; perhaps these early difficulties were a problem of mutual attunement. However, from the violin solo in Beim Schlagengehen, played with a wonderful, understated eloquence by guest leader Daniel Bell, the performance took a completely enchanting turn, which was sustained through the concluding In Abendtrot with all its birdcalls and nocturnal trappings. Hearing the Four last songs next to Elgar’s second symphony, it was striking to realize how similar, in some respects, their harmonic language is. The conventional line on Elgar is that he's an inheritor of Brahms while Strauss is more of a Wagnerian, but in the broader picture of the progressive undermining of tonality in the late romantic style, to which you'd add the likes of Debussy and Nielsen, Elgar is more the European than the provincial Englishman. Whether he was entirely comfortable with this direction is hard to say—the second symphony followed hard on the heels of the first, but he didn't return to the form for another twenty years or more. That's too bad, because the second symphony is a muscular, vibrant work, marked with some astonishing touches of virtuosity as well as passages of intense, brooding melancholy. It would be hard to fault Runnicles and the BBC SSO for their ebullient reading, which reached its apex at the celebrated 'hoofs of the horses beat' moment in the third movement, the percussionists each spanking their instruments with all their might—a slightly undignified spectacle, but a fantastic sound. Perhaps the relative weakness of the finale accounts for the work’s less than secure place in the regular repertoire: one thing the symphony doesn’t quite achieve is that final sense of catharsis. Vaughan Williams, in his sixth, makes a similar gesture to much more successful effect, but it is that kind of quietude.